The first time I was asked to get creating a communications strategy, I was super intimidated by the task. It seemed so important and I had no idea what to include until I’d spent about four hours Googling the topic! 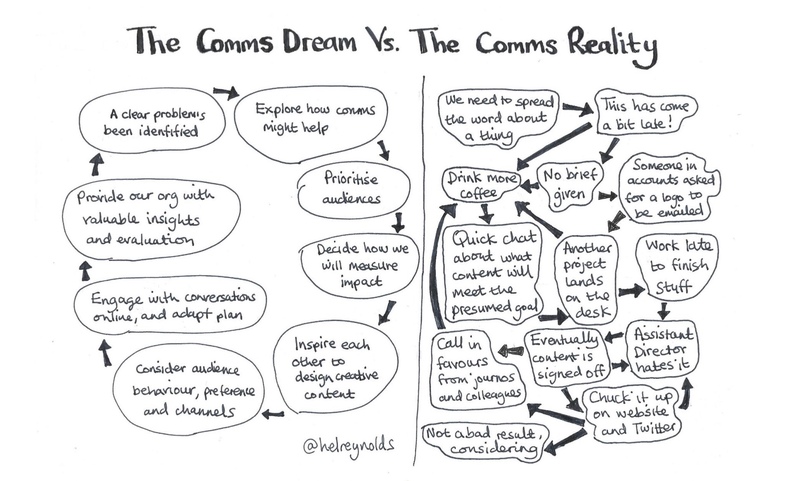 I don’t see much written about the experience of working on a communications strategy, so I’m DELIGHTED to share with you this guest blog post from a communications professional who has shared her honest and valuable insights on the process. Communications specialist, Tanya Edwards works for Jigsaw Homes Group, and has 12 years’ experience working in marketing and communications. As well as being a mum, a serial book hoarder and a partial to the odd gin (or two! ), she has bags of experience of working at a strategic level and influencing senior management to see the importance of internal and external communication. “Although I didn’t have experience of creating and working with a communications strategy before, I had experience of creating a marketing strategy which encompassed communications in it at the time, and focused very much on internal communications. Even with experience of creating a strategy, I still have reservations and worries when creating new strategies – especially with keeping up with new trends and adopting new techniques for communications. Sometimes it’s a case of sticking with what you know, but when you do introduce something new and it works, this far outweighs the worries. For me, strategies are based on the wider business objectives, but it’s also important to consider what the team wants to achieve. One thing that helps provide a focus is a team mission, so this should definitely be in the strategy. It helps limit some of the typical communications requests (you know what I’m talking about!). And as well as the micro-environment playing its part in shaping the communications strategy, the macro-environment should also be considered. The political landscape, legal factors, social and economic growth can change the direction and thinking of an organisation, especially within my sector – housing. The communications team set the objectives in our communications strategy. They were structured in a ‘what we want to achieve’ and ‘how we will do it’ format, so the aims were clearly identifiable, with evident links to the areas of the corporate plan they supported. They focus on outcomes as well as outputs, and are specific and measurable so our communications is more efficient. It is important for the strategies to be supported from senior management. This helps drive the overall culture of the organisation, so gaining buy-in from the C-suite is key. This can be a challenge, but seeing results from a well-structured strategy that supports the wider business objectives or corporate plan to succeed, demonstrates the important role communications plays as a strategic function within organisations. Our communications strategy has been instrumental in establishing communications as a strategic business function that can have a massive impact internally and externally. By having the strategy in place, the team has been able to focus on communications priorities which support the overall business objectives and build great relationships with stakeholders. This raised the profile of the team, helping others see the strategic input communications has to offer. It also allowed us to educate the business on what good communications looks like. Whilst some aspects of communications will remain reactive and unplanned, the strategy has helped support us to gracefully push back on some ad hoc demands and to also be included at the project planning stage. Brilliant stuff, thanks so much Tanya for such an enlightening guest post. To get help and advice with your communications strategy, or social media strategy, book on one of Hel’s masterclasses, or hire Hel to work with you.